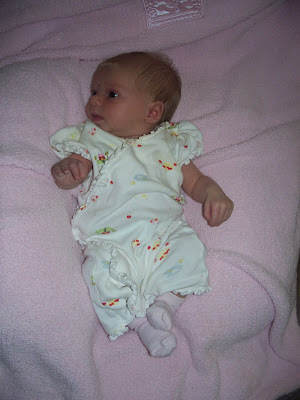 Here she is, about two weeks old, wearing newborn jammies. And they are waaaaayyyy too big. And here she is this weekend, wearing 3-6 month jammies. 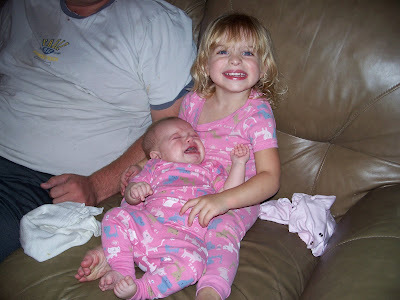 As you can see, Addi loves that they match, Sam is somewhat worried that she looks like a geek with matching clothes. A girl's gotta have style. But, at least they fit. I can only do so much. Oh, and the guy in the disgusting stained t-shirt that should have seen the bottom of a trash can about, oh, three years ago? That's my husband. Maybe now that the world has seen his yucky shirt I can throw it away. Fingers crossed.